Patrik Lindström Old School EBM, Electro-Industrial With just a few weeks apart, I received three EP's from a band called No Sleep By The Machine. For some reason, the album covers put me off, not that they are not beautiful art, but for some reason, it made me think of experimental ambient music which is not really my cup of tea. I left them untouched in the ever growing pile of promos to review until I one day took myself the time to actually listen to it. To my surprise, it was not ambient as I've predicted, it was Old School EBM and not only that, it turns out to be really well produced. How could I possibly let this slip me by and from my own country as well? Shame on me, I need a good spanking. After a full-length debut called 'Close' in 2010, they followed the footsteps of their landsmen Kite and released their tracks in EP format numbered by the ascending order of release date with four tracks on each and every EP. Instead of writing separate reviews on each of the three EP's, I will instead write a review of all the three EP's with their total of 12 tracks, a fairly regular set of tracks for an album. Each EP has its own flavor. The first one tastes English (read Nitzer Ebb), the second one tastes Canadian (read Skinny Puppy/Front Line Assembly) and the third one tastes German (read early 80's Front 242). However, the tastes are of course blended, but for some reason one influence seem to have a heavier impact on each EP. 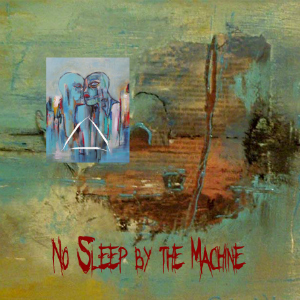 No Sleep By The Machine manages to stir up the static Old School EBM genre with their never changing beats into something that keeps me interested, focused even. I really enjoy the difference in phase, sound and structure. I even like the small difference in taste I wrote just before, that I can get something a slight different depending on what number I choose. It all ranges from the fairly monotone "Illuminate" from '1' to the more experimental and heavier "New Ideas" from '3'. I like that. It keeps me on my toes, constantly poking my side gently with a cattle prod, making sure I still giving it the attention it deserves. If you are curious of what No Sleep By The Machine is all about, I suggest you check out "Illuminate" ('1'), "Humanity" ('1'), "Choice" ('2'), "The Pit" ('2'), "Clickaduk" ('3') and "You" ('3'). I will not recommend one EP over the other, they are a set. To buy one would be like only reading Tolkien's "The Fellowship of the Ring" and skip "The Two Towers" and "The Return of the King", you simply can't. With just a few weeks apart, I received three EP's from a band called No Sleep By The Machine. For some reason, the album covers put me off, not that they are not beautiful art, but for some reason, it made me think of experimental ambient music which is not really my cup of tea. I left them untouched in the ever growing pile of promos to review until I one day took myself the time to actually listen to it. To my surprise, it was not ambient as I've predicted, it was Old School EBM and not only that, it turns out to be really well produced. How could I possibly let this slip me by and from my own country as well? Shame on me, I need a good spanking. Make sure you don't follow my example and ignore this; this is worth your attention.